California Native. Husband of @luckyandi. Father to Lucy and @princejackpup. Sr. Director of Customer Experience at Lyft. California Native. Husband of @luckyandi. Father to Lucy and @princejackpup. Senior Director of Customer Experience at Lyft. I had no idea what it takes to start a company. Late nights out of a living room, a lot of blood, sweat, and tears (ok, none of those really), and a good group of people. At the end of the day, it hasn’t been easy… Realistically, it is one of the most challenging things I have ever done. The best metaphor to working in a startup is running a marathon at a sprint pace. All the training in the world won’t prepare you for the emotional, mental and physical investment of getting a great idea off the ground. And to beat the competition, you have to run faster than you have run for longer than you have ever run. Your 100% isn’t quite enough. At one point it was. Maybe in college. Maybe in a 9 to 5. But in the startup world, all you previously felt you had to give isn’t quite sufficient to do what is necessary. You have to rise to the challenge and make efforts above what you previously thought your were capable of. You have to learn to work both smarter and harder. Busy work doesn’t exist in a startup. Neither does “spinning your wheels”. If you are doing the same thing day in and day out without results, you are doing something wrong. Revise your approach until you find something that works! Get innovative. If you are in a startup, you are an entrepreneur. Don’t expect others to think for you and don’t expect the answers to just drop into your lap. Actively search for creative solutions to any and all problems that you encounter. Rest strategically. If you work a 100 – 120 hour weeks back to back, your actual productivity will being to decline over time. Taking a break from the day to day allows you to take a step back from your challenges and think about them more creatively. You can’t do it alone! Surround yourself with people you can trust and rely on. People that will both help you through all the difficulties that the startup life brings. Just my reflections on the last few months working with @FiveStarsCard! Do you work with a startup? What has been your experience? Do you have any other advice? Since I last wrote, I have gone from Cusco, Peru to Lima. Lima to Buenos Aires. From Buenos Aires on a 4000 mile roadtrip through Patatgonia to Córdoba. From Córdoba to Buenos Aires. Buenos Aires to Portland. Portland to L.A. So here´s itinerary: We traveled from Buenos Aires to Bahía Blanca and then straight onto Peninsula Valdéz. From Valdéz through Gaiman (for some Welsh tea!) to Parque Nacional Los Alceres. North through El Bolson and Bariloche to the Ruta de los Siete Lagos. Launching off from San Martin de los Andes to Parque Nacional Lanín for a Volcano hike and sleeping under the stars. North to Chos Malal for hot springs and then onto Córdoba (21 hour drive). From Córdoba to Buenos Aires to return the car. And… the highlights of the roadtrip: sleeping in hammocks for two weeks straight, driving all night, seeing more stars than I ever have before, waking up to the sunrise, petting armadillos, trying to catch trout, swimming in crystal clear rivers and lakes, cooking over open fires, off-roading, getting off the beaten track and seeing Argentina from behind the wheel. And for me personally, learning to drive stick. This is a hybrid post. Half consists of pieces taken out of my last Kiva Fellows blog. And the other half from my final musings and future plans (I won´t be blogging for at least a month). Feel free to cry now. Click above to read the full post “Last July, I sat in Kiva headquarters listening to speaker after speaker desperately trying to get a grasp on what life as a Kiva fellow would be like. Despite all my “international” experience, I don´t think anything could have prepared me for the adventure that was to come. Personally, I set out to discover how microfinance worked, IF it worked, and how it impacted the lives of the people it touched, but I really had no idea what lay ahead of me. On the flip side, I have had a chance to surf in four new countries, to climb four volcanoes (including Concepción in Nicaragua with some other Kiva Fellows! ), and hike the Inca Trail. On the down side, I have been robbed once and assaulted another time, but I wouldn´t trade my two Kiva fellowships in Guatemala City and Cusco for the world. As far as the future, I have a road trip through Patagonia planned with Devin Dvorak (starting on Feb 14th!). Coming back to the states, I’m heading up to Portland for a week, and after trying to find a job in Los Angeles. My experiences with Kiva in Central and South America have truly been an adventure, one that I wouldn’t trade for the world. Thanks for all your prayers, support, and for reading my blog! I promise to blog when I’m back in the states about my exploits! The Meeting Place: Delicious Waffles, Quality Bacon, Juices, Pastries and the best coffee in town. All profits go to local orphanages and ministry projects. Can life get any better? I submit that it can not (Brian Regan) On the San Blas Plaza. El Buen Pastor: Decent coffee, but absolutely spectacular pastries. I´m talking chocolate croissants, peach and apple filled baked goods fresh out of the oven, and delicious donuts. On Cuesta San Blas. La Bondiet: My favorite coffee shop in town. Mouthwatering cakes, cones filled with dulce de leche, small brownies, great smoothies, classy atmosphere, and great coffee! Located a block off the Plaza de Armas on Plateros and on the small plaza next to the Plaza de Armas. Be brave and head to the markets. I personally find the San Pedro market a little dirty, but recommend heading to Garcilaso and the Wanchaq market for a bite to eat (walk away from Garcilaso until you get to the food stalls in the building). Ask for Sr. Jamie and try his Lomo Saltado or Arroz a la Cubana (S./7 and S./3) and try a juice from one of the ladies opposite his stall! Jack´s: alternatively, try the lonely guide / rough guide favorite at the bottom of Cuesta San Blas for big and late breakfasts (El grande), gourment sandwhiches, and soups like Tuscan vegetable or pumpkin that make your mouth water (my Mom went 3 times in 9 days! That says something for the quality of their food). Olas Bravas: Ceviche is excusively a lunch food, and Olas Bravas on Mariscal Gamara near the start of Av. La Cultura does it well. Try the Jalea, the Lomo Saltado con Tacu Tacu, and the Ceviche Mixto (warning, huge portions). 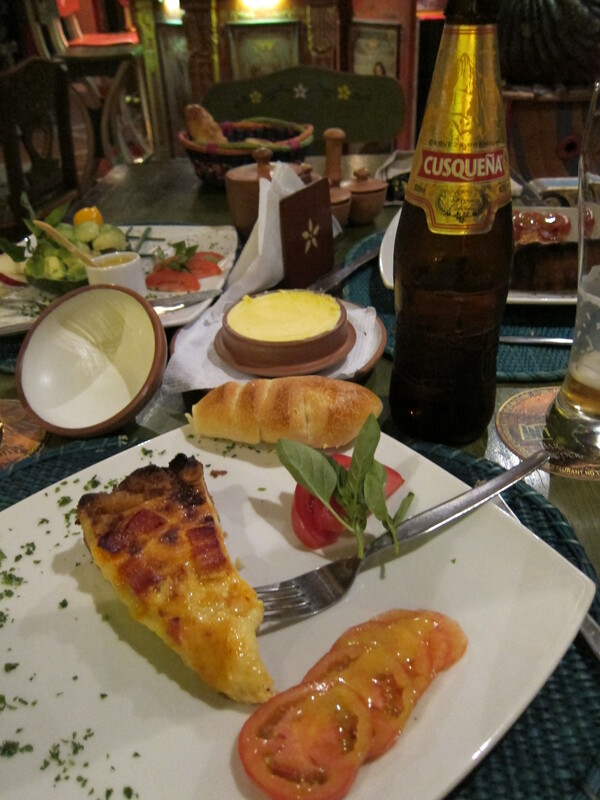 I think I could eat at a different restaurant every night in Cusco and still have thousands to try. Some of my highlights have been fusion cuisines near the town center. Cicciolina: Located a block off the Plaza de Armas on Truinfo (second floor). Absolutely incredible tapas, wine list, and the best Pisco sour that I have had in Cusco. (U.S. prices and reservations suggested in high season). Two Nations: An Australian / Peruvian fusion restaurant a few blocks off the plaza that has a giant burger, good soups, and solid Peruvian cuisine. Walls decorated by happy diners. Los Perros: Two blocks off the plaza. And makes this list because it is the home of one of the most delicious burgers I have had (and one of the largest) with great potato skins, and other sides. 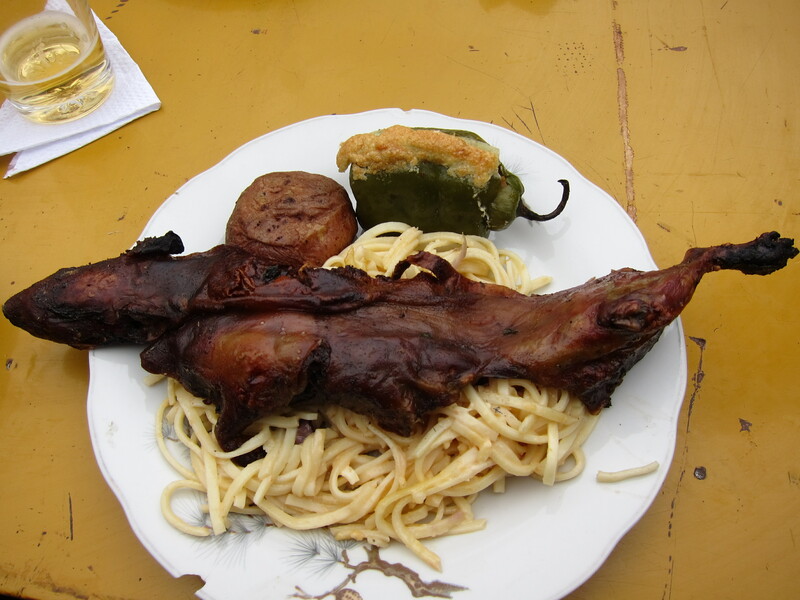 Cuy: I don´t think a Peruvian food post could escape without mentioning the family pet that ends up on Peruvian´s plates as a delicacy on holidays. Also more commonly referred to as guinea pig. 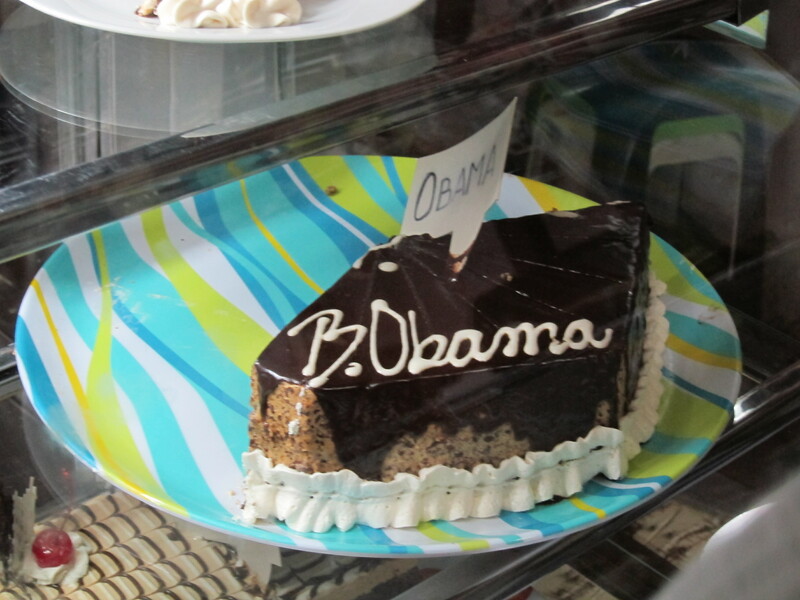 Besides the unusual presentation, it wasn´t half bad. A little greasy, and difficult to eat around all its little bones, but when it’s stuffed with herbs, served on a bed of noodles with a rocotto relleno (stuffed pepper), it was definitely edible. Just close your eyes and take a bite! The other “unique” food served in Peru is alpaca. Alpaca steaks are low in cholesterol, slightly gamey (think along the lines of venison but to a lesser extent), and generally free of excess fat. My Dad mentioned the similarity in taste to an excellent pork chop and that´s a pretty good description too! As I previously mentioned, fusion cuisines are pervasive here in Cusco highlighting everything from French/Peruvian or Australian/Peruvian to Chinese/Peruvian. One of my favorite fusions we encountered last weekend in Aguas Calientes after seeing Machu Picchu at Indio Feliz, a French/Peruvian restaurant. 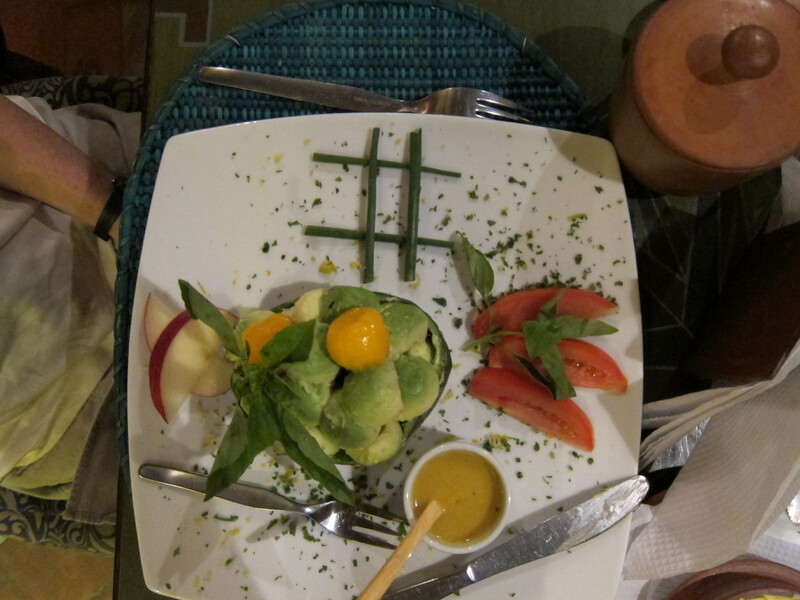 For about $15, you started out with a soup or salad (such as the Avocado / Mango salad or Bacon and Egg Quiche below), main course (such as my Dad´s pineapple chicken or my Mom´s Mango trout), and finished with a dessert. Delicious. Sometimes it feels like my life is in transit. I wonder in those moments if life is a sum of the places you are waiting to go, or if the key to life is enjoying the journey and the mundane, endless hours in the terminals of… wherever. And as it turns out… It is. If you don’t enjoy the process of getting there, you will miss out on those perfect sunsets, the people you met along the way, and when you get to your destination, you will only be thinking about how much you hated getting there. All of these thoughts are summed up in my latest trip down south to do a borrower verification with our field partner, Manuela Ramos. It started out last weekend when I took a trip to Arequipa to see American movies (yes they have a theater), to see Mt. Misti rising up from the town, and to read in the shade of every park I could find. From there, I took another bus to Puno passing the high mountains and flamingos and deserts and lakes. In the first two days in Puno, I had traveled all over Juliaca and beyond, and down to the Bolivian border near Yunguyo. Which added up to waking up before sunrise, and getting back hours after the sunset over Lake Titicaca. 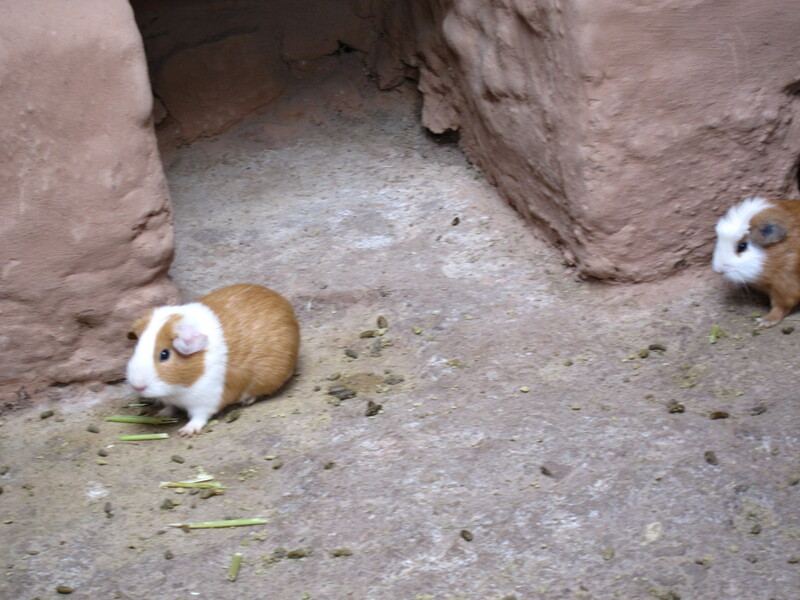 Unfortunately, one very elusive borrower had taken off to Moquegua (another part of Peru). And if I couldn’t find her, I had to visit another 10 new borrowers. With parents arriving on Monday, I choose (reluctantly and not enjoying the journey) the 7 hour trip for a 15 minute interview. I was back in the morning, and headed out to the spectacular islands on Lake Titicaca. First to the famous floating islands Los Uros which I visited three years before, and then to spend a night on Amantani and a morning on Taquile. I ended my stay with a cannonball in the freezing cold lake (did I mention that the lake is 3810m high??). 70 plus hours on buses, trucks, vans, boats. Exhausted. But happy. Remembering that traveling, meeting people, the journey, is why I did this in the first place. 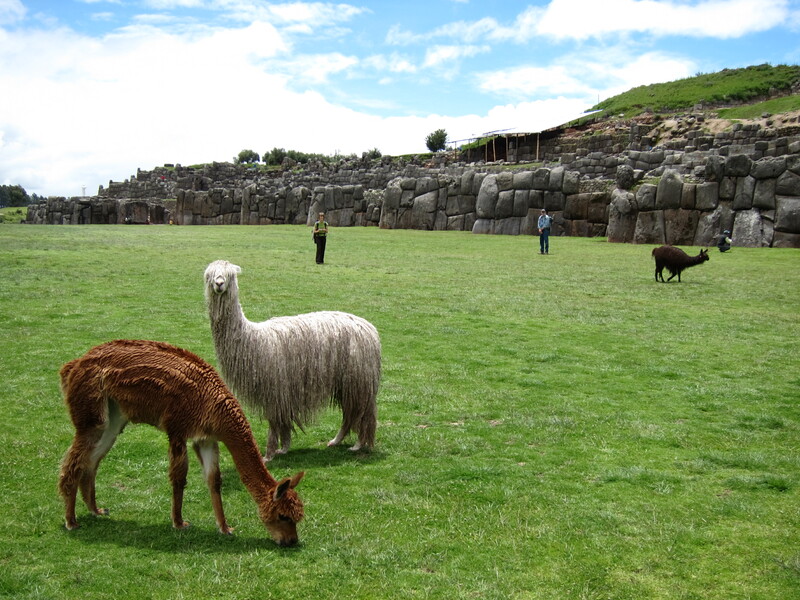 This past weekend, I settled on trying to sneak into Sacsayhuaman and White Water Rafting. Not to bad eh? I spent Saturday morning walking around the small villages surrounding Sacsayhuaman and climbing rocks until I got into the main section of these spectacular ruins. Then yesterday, we headed up to Huambutio to go white water rafting on a III+ river with a coworker´s husband. After two hours on the river / rapids, I was exhausted from paddling, but more excited to do it again on a IV river the next time!